Huge welcome to those new to my blog! Thank you so much for popping by and I hope you enjoy my writing. Right, first off I was not a well girly at all last week, I nearly thought a nasty head cold was going to get the better of me, I am not looking for sympathy whatsoever LOL but its the truth, so even though I am delighted to have completed my first marathon and can't wait to do my next, I feel like I lacked giving it my all, but nonetheless I was delighted to have completed my first 5K in 58 minutes (official) my clock told me different I did it in about 54 minutes but 58 minutes is now my goal to beat the next time and by a long shot. The marathon was all in aid of The Mark Pallocks Trust. Mark, an athlete with blindness, suffered horrific spinal injuries in 2010 which left him paralysed and he has vowed to raise funds to help find a cure for him and the millions of paralysed people around the world to walk again. The Life Style Sports Run into the Dark marathon plays a vital role in raising these funds. 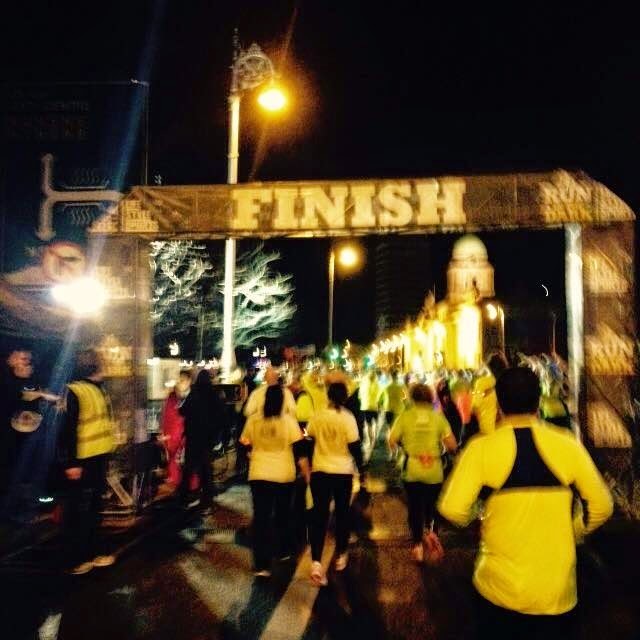 As the night turned Dark on Wednesday the 12th November, in over 30 cities across the world, many people took part in this marathon. 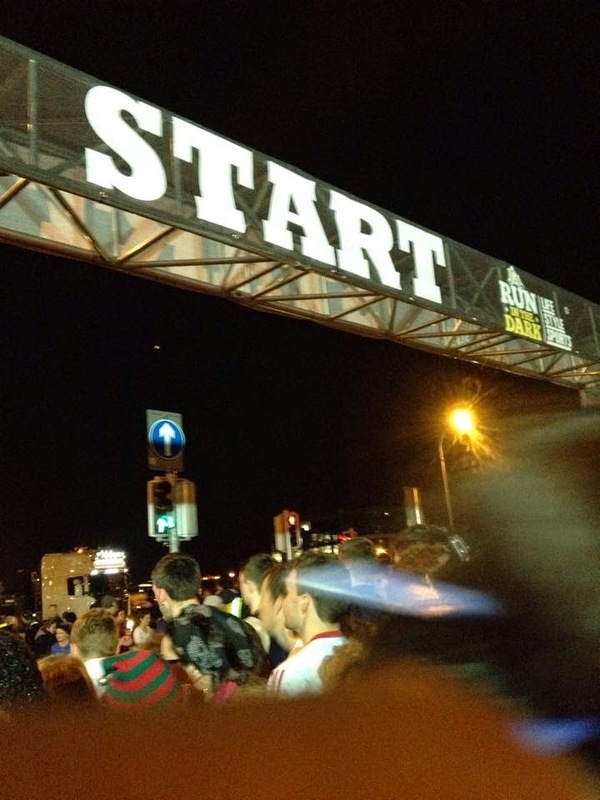 All participants wore a flashing arm band and as the runners ran ahead you could see a sea of red lights ahead from bridge to bridge and from road to road. It was just lovely to be a part of it. 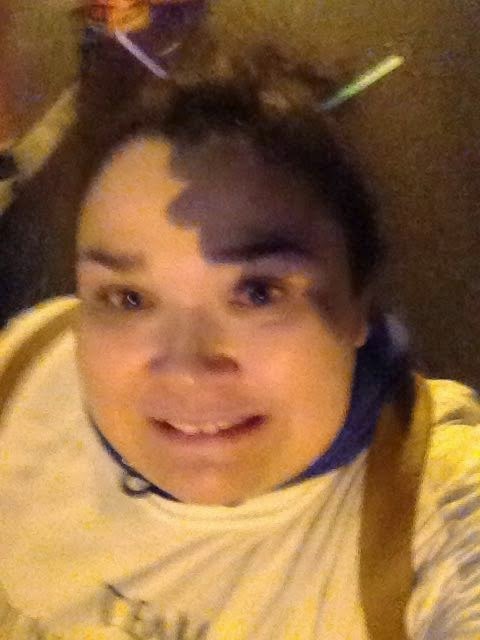 I am currently looking out for my next marathon ;) The marathon was truly a brilliant experience. Watching the runners alone who completed the 10K was inspiring and motivating and a reminder of how fit I've become (and also how far I still have to go). There was a wonderful atmosphere amongst everyone, from the journey on the Luas over, to us heading home having the LOLs. It was a great night all in all plus I got a goody bag at the end of it I was only delighted with!! I did feel it the next day and by felt I mean my legs where seriously 'paining me' ha and putting in a 12 hour shift only left me feeling in even more pain but as I have said before this is good pain because I know its my body getting stronger and fitter and you know the saying 'no pain no gain' well that saying has never meant so much to me in my life! Style wise this week, I had my nieces christening on Sunday gone and for some reason I find these occasions hard to dress for... 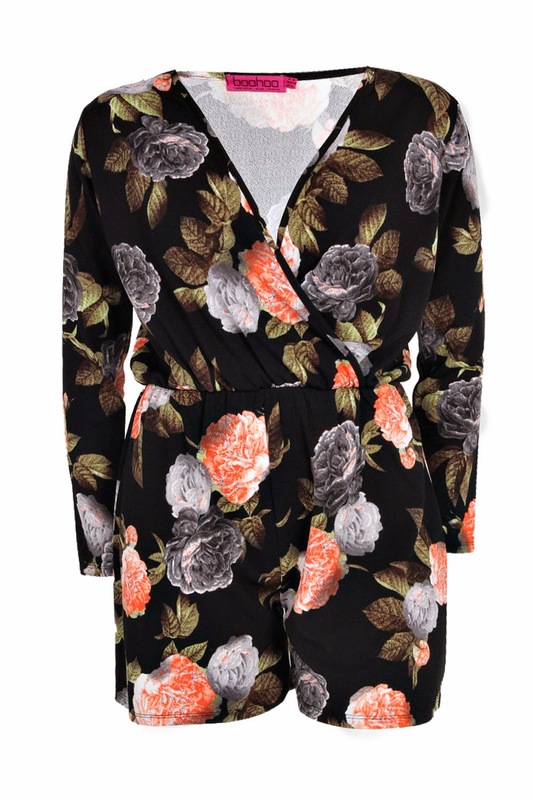 I am not your average glitzy dress type person but at the same time I wanted to look 'nice' and not like I was heading out on a night out with my chummies (vans and jeans suffice for these nights lol) So I came across this play suit on boohoo.com which is fast becoming a favourite online shop of mine. They have a huge plus size section, up to size 24 with lots of variety, styles and very reasonably priced. It has a floral design and long sleeves so my name was written all over it! I themed it up with thick black tights and wedge boots and statement neck lace I have featured on my blog before, straight hair and a red lip. And I was ready for my little pumpkins christening and night out that followed. This cost me 35 euro with 15% off on top of that so it was just under 30 euro, absolute bargain! 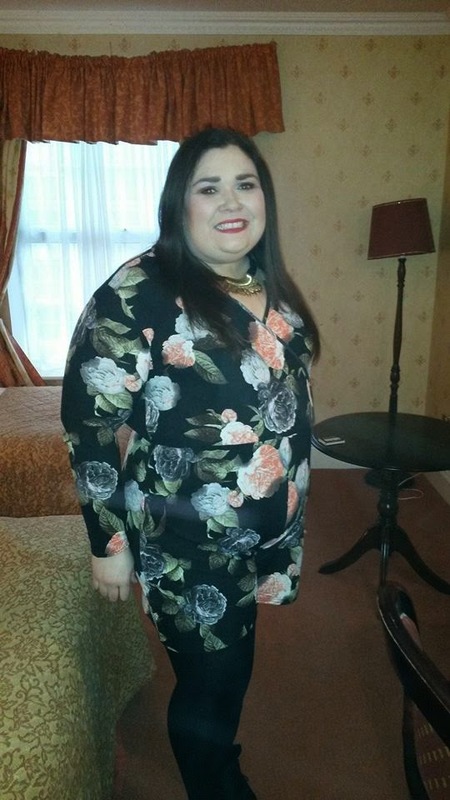 I also love the cut around the chest on it and I got many compliments on my weight loss in this outfit. I thought I would mention a product I have been loving, all year in fact and its this Mac blush in Dolly Mix. 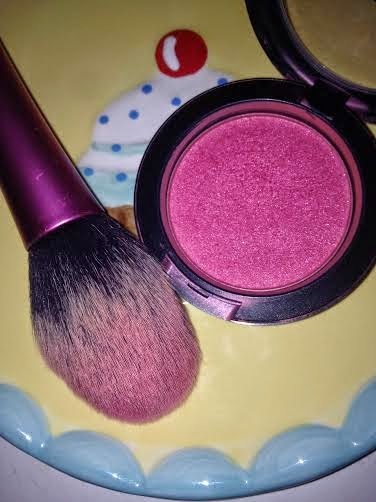 Its a gorgeous pink girly blush that I have used quite a bit. And I haven't even touched pan on it yet. That's what I love about Mac cosmetics, you get so much value for your money some of their products seem to last forever and this is definitely one of them! I use my Real Techniques blush brush to apply this, which is one of my 2 favourite brushes from the Real Technique collection. So there you have it guys. I hope you enjoyed this post. Please let me know and I'll keep dishing these out! I have exciting things coming up next week I look forward to bringing you them too.